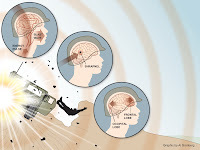 The Defense Centers of Excellence for Psychological Health and Traumatic Brain Injury (DCoE) may be too dysfunctional to carry out its mission, the US Government Accountability Office (GAO) concludes in a new report. Part of that mission is to study how hyperbaric oxygen therapy (HBOT) may help some wounded soldiers suffering traumatic brain injury (TBI) and posttraumatic stress disorder (PTSD). Surely DCoE funds flowing into the hyperbaric medical community will face serious review and closer scrutiny going forward. Once again we suggest readers tune in to NPR and ProPublica for excellent coverage of this important topic. Listen to a 4-minute story on Morning Edition. Read ProPublica's latest Brain Wars article, "Gov't Watchdog Criticizes Pentagon Center for Brain Injury, PTSD," for more information and helpful links. O2.0 is the news blog of HyperbaricLink, the independent web guide to hyperbaric oxygen therapy.